During the IBC2016 event in Amsterdam, the transmission of a 10K x 2K panoramic video signal via satellite to multiple devices is going to occur. This groundbreaking R&D project is going to be presented by SES S.A. (Euronext Paris and Luxembourg Stock Exchange: SESG) with Fraunhofer Heinricht Hertz Institute HHI Berlin. The panoramic signal will be received at the SES stand and transmitted to an Ultra HD display as well as to a set of virtual reality (VR) head-mounted devices. The viewer will then be able to select a viewing angle, zoom in and out, turn the picture on the TV display using a simple remote control, or choose to wear a VR headset where the video signal will be delivered simultaneously. 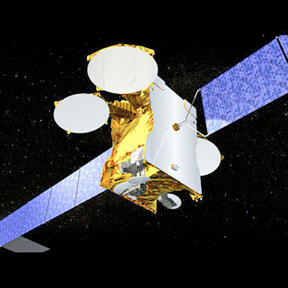 Artistic rendition of SES' ASTRA satellite at the 19.2 degrees East orbital slot. Filmed with Fraunhofer HHI's OmniCam-360 camera and transmitted via SES's ASTRA satellite at the 19.2 degrees East orbital position, this demo will provide a first glimpse of what a future VR 360° video would look like. For the first time, this demo allows the viewer a truly immersive experience of being part of a virtual event, whether it’s sports, concerts or other live shows. Dr. Ralf Schäfer, Fraunhofer HHI's Head of Division Video, remarked that his company will use a combination of technologies to showcase what is possible when using hybrid approaches. There is no stadium in the world that can provide enough seats for all of an event's enthusiastic fans, so imagine a live event somewhere in the world—filmed with professional cameras like the OmniCam-360—and then delivered to a huge global audience via satellite—every single viewer at home has the best seat in the middle of the show. According to Thomas Wrede, the Vice President Reception Systems, SES, satellites are the perfect distribution path for these new kinds of video experiences, as they can manage huge volumes of data being offloaded from terrestrial networks. Furthermore, technology standards such as SAT>IP allow the viewers at home to pick and choose a device—the TV screen, tablet or virtual reality equipment—and they can now select their favorite viewing position, as well.